While the Assad regime has proven itself resilient by organising a political marketplace with its loyal cronies and is zealously proclaiming a Pyrrhic victory to the international community, there is growing discussion in Europe about the possibility of a rehabilitation of the Syrian regime.1.Youssef, Myriam. 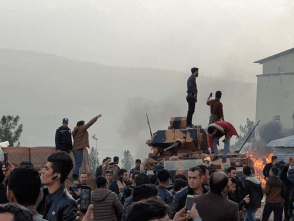 “Syrian people suffer after Pyrrhic victory” Conflict Research Programme publication (12 Feb 2019) Italy, currently governed by a populist alliance between the Five Star Movement and the far-right Lega Salvini Premier, suggested that it might reopen the Italian embassy in Damascus. Hungary and Poland, also ruled by right-wing populist parties, are eagerly joining in this reflection. The common ground for this rapprochement attempt is clearly linked to the so-called refugee crisis, which is increasingly treated as a prioritised policy issue by populist parties.2.Tanja Börzel/Thomas Risse 2018: From the Euro to the Schengen Crisis: European Integration Theories, Politicization, and Identity Politics, in: Journal of European Public Policy, Vol. 25, No. 1, pp. 83-108. Despite their attempts to represent themselves as products of democratic processes, Hungary as well as Poland’s populist governments remain the main threat to the EU’s liberal orientation.3.Daniel Kelemen 2017: Europe’s Other Democratic Deficit: National Authoritarianism in Europe’s Democratic Union, in: Government & Opposition, Vol. 52, No. 2, pp. 211-238. Beyond this they become the main obstacle for a formulation of a common policy at the EU level, to deal adequately with this humanitarian crisis. Initially founded as a party that positioned itself against a deeper integration of the Euro, the AfD took advantage of Angela Merkel’s refugee policy in 2015 to sharpen its own anti-immigration policy.8.“AfD: Die Anti-Euro Partei” : Deutsche Welle In addition to a friendly attitude towards Russia, the AfD is also renowned for cheering associated authoritarian regimes. 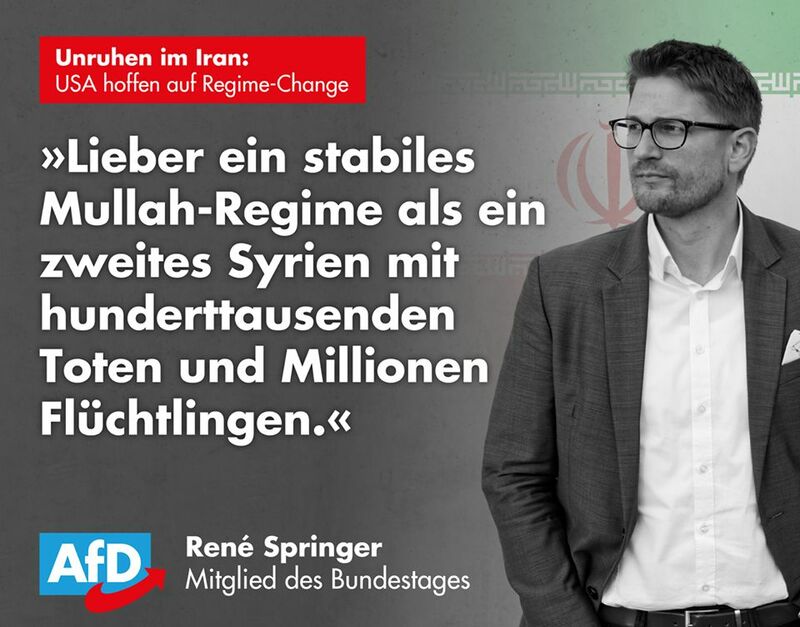 For example, MP René Springer has publicly argued against the continued support of the young demonstrators in Iran, saying: “Better a stable mullah regime than a second Syria with a hundred thousand dead and millions of refugees.”9.Facebook of MP Rene Springer. The subtle political intention of this statement is based less on an active sympathy with the ideology of the Islamic Republic and more on pure self-interest in ensuring stable regimes and eliminating any causes for flight to Germany. Deeming the German media untrustworthy and the Federal Government reliant on reports from local, biased sources such as White Helmets or the Syrian Observatory on Human Rights to assess the security situation in Syria, the AfD decided on the 5th March of 2018 to send a diplomatic delegation to Syria to better understand the security situation.13.“AfD-Abgeordnete besuchen Syrien“ : Compact Online14.“Vorsicht vor Fake-News über Syrien” : AfD Online15.“AfD-Delegation reist durch Syrien” : Der Spiegel The radical right-wing magazine Compact reported on the journey, wherein the delegation met with the Grand Mufti of Syria, Badr ad-Din Hassun, who was quoted as threatening to fight Europe with suicide bombers should European states attack Syrian soil.16.“Syria clergyman threatens West with suicide attacks” : Haaretz The trip’s urgency echoed the desire of the AfD to plead for a re-evaluation of the Pariah status of Bashar al-Assad as the legitimate president of the Syrian Republic. 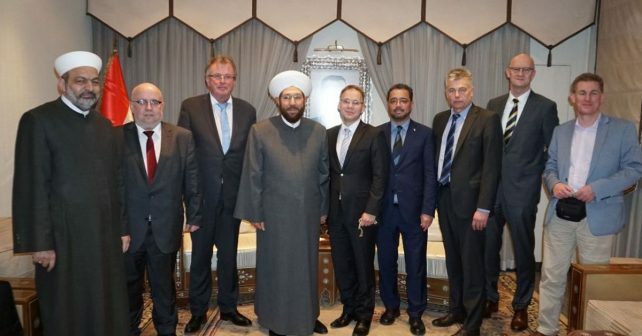 According to delegation leader Christian Blex, the controversial statement was taken out of context, and Badr ad-Din Hassoun had allegedly apologised to the AFD delegation for this misunderstanding.17.https://www.youtube.com/watch?v=I4r3gA81jAo&vl=de The AfD delegation was also introduced to a range of other religious authorities, all of whom spoke in favor of the return of refugees from Europe. A visit to the Syrian Red Crescent (SARC) and Minister of Reconciliation Ali Haider was also on the agenda.18.“AfD-Abgeordnete besuchen Syrien“ : Compact Online Ali Haider is the head of the Syrian Social Nationalist Party (SSNP), which demands for a unified, identitarian Syrian nation and should be seen as the fig leaf of the regime’s political concession for a diversification of its one-party system. 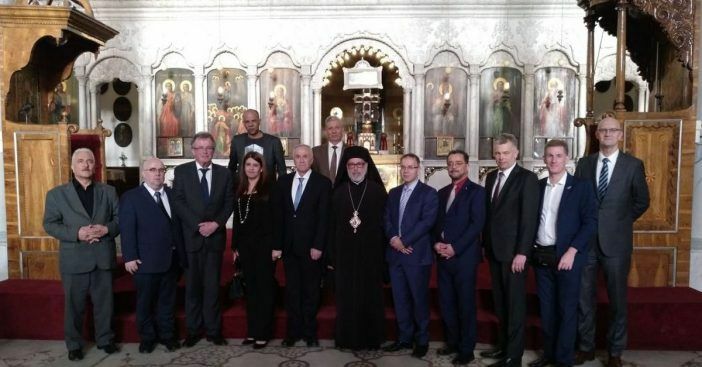 Apart from the fact that the delegation had met with religious representatives, which were chosen by the regime to be sold as a civil society, one can see how indifferent the AfD is to the root causes of the Syrian crisis.19.Thomas Pierret 2012: The state management of religion in Syria : the end of “indirect rule”?, in: Middle East authoritarianisms: governance, contestation, and regime resilience in Syria and Iran.20.Sparrow, Annie. “How the UNOCHA Helped Assad and Hurt Syrians in Need” Foreign Affairs publication (1 Feb 2016)21.Joseph, Daher. “Revolution and Counter-Revolution in Syria, origins and developments” Universite de Lausanne, Lausanne, France (2018) The presentation of the diversity of religious groups in Syria is the usual tactic of the regime to present its apparent inclusiveness and thus obtain diplomatic re-legitimisation.22.Gerlach, Daniel. “Herrschaft über Syrien: Macht und Manipulation unter Assad, Berlin” 2015. Another common claim is that Assad positions himself as a champion against Islamic terrorism, which makes him a potential partner.26.AfD MP Hans-Thomas Tillschneider on Facebook.27.“Scharfe Kritik an Syrien-Politik der Bundesregierung” : AfD Online In an interview with the Westdeutscher Rundfunk, Blex insisted that in the then-besieged city of East Ghouta the terrorist group Jaish al-Islam made regular attacks on Christian institutions in Damascus, conducted executions of individuals with different persuasions, and prevented civilians in passing through the “humanitarian corridors”, which were arranged by the Syrian regime.28.https://www.youtube.com/watch?v=I4r3gA81jAo&vl=de The mere reference to the sectarian dimension of the conflict poses another problem, since Blex moralises the brutal reaction of the Syrian state towards rebel authoritarianism without questioning the violence’s social origins, which is nothing more than a denialism of the multi-causality of the Syrian conflict. 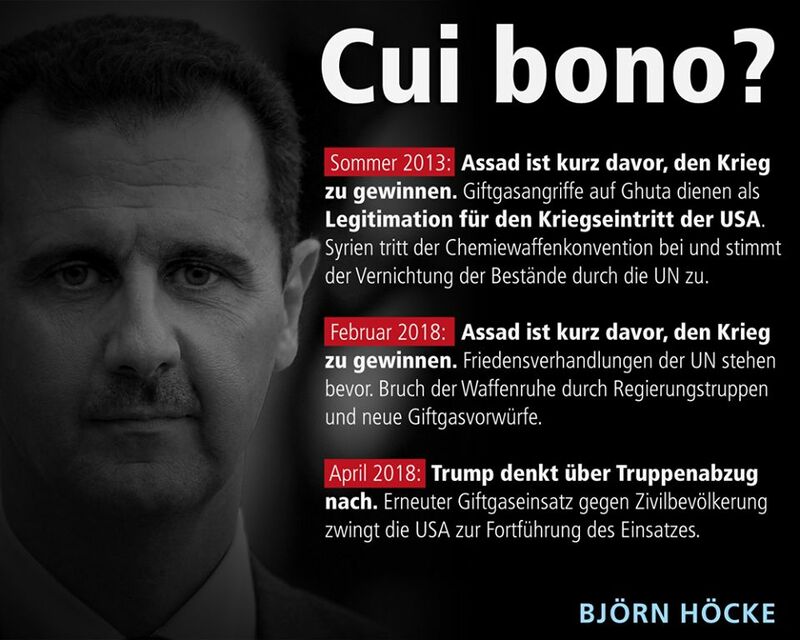 This adoption of the one-sided narrative of the regime became especially obvious after the chlorine attack by government forces in Douma in April 2018, where the Thuringian parliamentarian Björn Höcke – founder of the far-right faction “Der Flügel” – openly questioned why the Syrian regime would use chemical weapons in a Facebook post, claiming that they had no reasons to do so.29.AfD MP Bjorn Hoecke on Facebook. 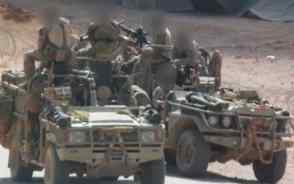 outside Damascus, as a “precipitous step”.30.“Details emerge about Syrian sites targeted by U.S.-led airstrikes” : Washington Post31.“Gauland: Angriff auf Syrien war voreilig!” : AfD Online In this context, it is interesting to note that some individuals within the AfD engage in conspiracy theories propagated by Russian media, namely Sputnik and Russia Today. They repeat the talking points of these groups, charging rebel groups with using chemical weapons to spark Western intervention. This technique of blurring and questioning perpetrator-victim relationships is a common tactic of the Syrian regime. 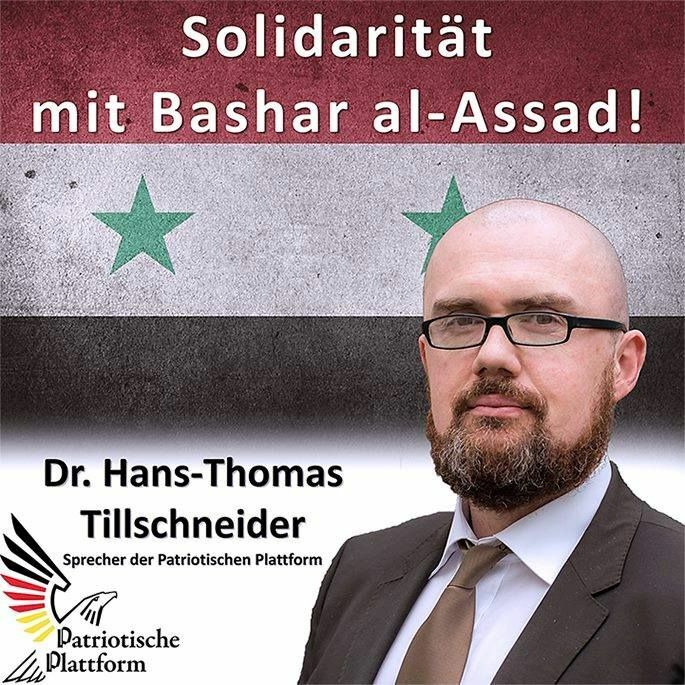 The development of this media strategy culminated with an announcement by AfD after the Sarin attack in Khan Sheikhoun, when an MP issued a statement of solidarity with the “legitimate Syrian president”.32.AfD MP Hans-Thomas Tillschneider on Facebook. A real differentiated view of the Syrian government and their atrocities can’t be recognised in the discourse of the German populists. The current foreign policy spokesman for the AfD in the Bundestag, Paul-Armin Hampel, feels compelled to relativise his party’s sympathy with the regime and to represent the call for diplomatic talks with the Assad regime as a realistic policy in the interest of the German state. Apart from a reference that Assad is not a flawless democrat and therefore would not agree with the German understanding of democracy, the party refuses to engage in any deep criticism.33.“Das Kalkül hinter den AfD-Reisen nach Syrien und Russland” : WELT The active courting of the Syrian regime by the German right-wing populists, however, can finally be recognised again in its functionality as a place to return the Syrian refugees, whom they refer to as social parasites of the German state. 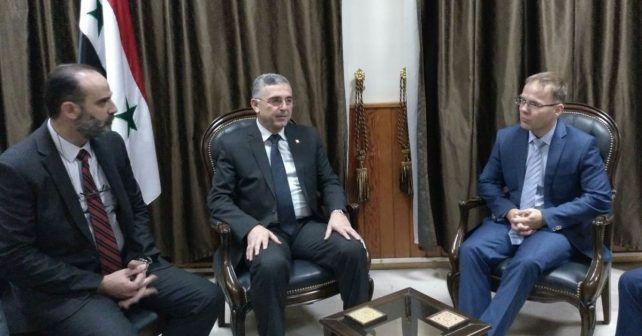 Almassian describes himself as a devoted supporter of the Syrian regime, and is openly committed to whitewashing the atrocities of the regime and its associated militias. 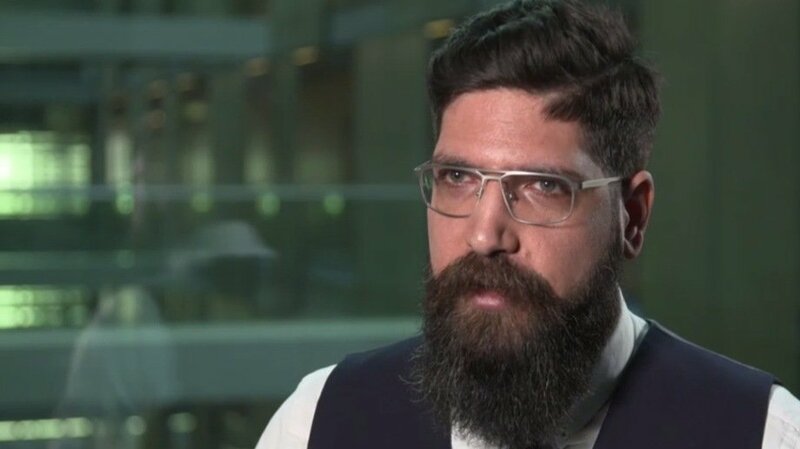 In one case, he claimed that the Amnesty International’s report on mass exterminations in Sednaya are “poor, biased propaganda”.41.“Der gute Assad-Flüchtling der AfD” : Watson In an interview in 2016 with the radical right-wing newspaper Sezession, Almassian gave some crucial insight into his knowledge of the Syrian conflict. He mentioned that the city of Aleppo had to be besieged because the Syrian regime wanted “to spare human lives”. He also claimed that there was never a democratic revolution, but that it was dominated from the start by religious radical forces. He also asserts that a large part of the Sunnis from Aleppo were skeptical of the “dubious revolution”.42.“Als syrischer Christ in Deutschland” : Sezession This repetition of the narrative of the Syrian regime on the causes and the actors of the conflict, becomes particularly interesting to identify how the discursive construction of the Syrian refugee by Almassian complements the construction of the identity of the refugee by the German right-wing populists. Terrorism and terror threats therefore function as the foundation of his propaganda.47.Barry Buzan, Ole Wæver, and Jaap de Wilde 1998: Security: A New Framework for Analysis, Boulder. In his book on the discursive construction of the war on terror, Richard Jackson has described the discursive nodal points that convey to the discourse participants various symbols, metaphor, and contexts, thus constructing a certain reality that suggests a threat.48.Richard Jackson 2005: Writing the war on terrorism: language, politics and counter-terrorism, Manchester The reference to the fight against terror also serves to moralise the discourse, which is crucial for the populist narrative. In this context, a consciousness that has been socialised in the West is addressed, to participate in the fight against all forms of terror, just as the Federal Government also engages in its modest participation in the fight against ISIS.49.Presse und Informationsamt der Bundesregierung report. Almassian describes his roommates in the refugee camp as savage and aggressive, with unabashed sympathies for militant groups like ISIS, Jaish al-Islam, and Al Qaeda. He describes their behavior as aspects of a personality that can’t be integrated into a Western society, while describing himself as well-educated and civilised. This contrast acts as the cornerstone of a populist, discriminatory division of refugees from Syria. Interesting in this context is the statement of Almassian in which he emphasizes the Sunni affiliation of his roommate’s as well as their local origin, namely Homs, Raqqa, Idlib and Daraa, as preeminent characteristics for their description.50.“ARD hetzt gegen legalen Flüchtling” : Compact Online It is no coincidence that only those places were listed in which the protest against the regime was the most popular, but it also reflects profound regional and sectarian discrimination, which is a product of the clientelistic system of rule of the Syrian regime.51.Abyad, Maya. “Racism, sectarianism, or sexism? On Damascus and the Syrian demographic barcode” Published on OpenDemocracy (10 Oct 2018) In her recent book “The Rule of Violence: Subjectivity, Memory and Government in Syria”, Salwa Ismail gives a comprehensive insight into the regional, ethnic & socio-economic discrimination and racism of Syrian society. The functionalisation of sect and regional affiliation is an “element in the institutions of coercion” of the Syrian regime as well as the narrative expression of the “patterns of populist co-optation”, which integrates some social groups into the regime while leaving others outside.52.Salwa Ismail 2018: The Rule of Violence: Subjectivity, Memory and Government in Syria, New York, pp 86-90. Almassian accuses the majority of Syrians who fled to Germany of being potential threats to the German society, because they have already experienced a degree of Islamic radicalisation, which enables them to even carry out terrorist attacks in Germany.53.“Als syrischer Christ in Deutschland” : Sezession His solution to this problem has been welcomed by his right-wing populist counterparts in Germany: a harder examination of the arrivals, and more rigorous police action against his Syrian compatriots. According to him it is necessary to crack down hard on Arabs, as it is required by the Arab culture.54.“ARD hetzt gegen legalen Flüchtling” : Compact Online In the full expression of his Hobbesian worldview, Almassian recognizes a man like Assad as the Leviathan, who keeps his Demons in awe. The threat of a social polarisation and an experience of violence such as in Syria can only be averted in Germany if the same methods of the kingdom of fear are used.55.Synaps Network. One might think that the role of Almassian as a protagonist in the political competition of the AfD would be overestimated, but one should imagine the perfidious function of his form of political articulation for their own purposes. Almassian’s personality also serves a dual role in the rhetoric of German right-wing populists: on the one hand in his identity as a Christian, whose culture the Western community must protect, and on the other in his identity as a Syrian. His statements can be given to the ordinary voters as an ‘insight’ into the ‘reality’ of Angela Merkel’s policy of “Wir schaffen das” (“We can do it”). A reality in which fanatics do not only live at the expense of Germans, but could also become a threat to their physical well-being. Everything proofed by a Syrian, who speaks against his peers and predicts chaos to the masses, setting the stage for trouble. Where the AfD is looking for Islamist sleeper cells and perils in German society, Almassian offers the appropriate answers. While he helps the AfD find the right arguments for its tough campaign for more votes, the populists support the Syrian regime in regaining their political re-legitimisation in the minds of the German public. The relationship between a populist party from a European country and an agent of a repressive regime, to the expense of those who have fled a war of attrition, is an authoritarian co-operation which is second to none in Europe. "Assad or We Burn the Country"
2. ↑ Tanja Börzel/Thomas Risse 2018: From the Euro to the Schengen Crisis: European Integration Theories, Politicization, and Identity Politics, in: Journal of European Public Policy, Vol. 25, No. 1, pp. 83-108. 3. ↑ Daniel Kelemen 2017: Europe’s Other Democratic Deficit: National Authoritarianism in Europe’s Democratic Union, in: Government & Opposition, Vol. 52, No. 2, pp. 211-238. 9. ↑ Facebook of MP Rene Springer. 19. ↑ Thomas Pierret 2012: The state management of religion in Syria : the end of “indirect rule”?, in: Middle East authoritarianisms: governance, contestation, and regime resilience in Syria and Iran. 22. ↑ Gerlach, Daniel. “Herrschaft über Syrien: Macht und Manipulation unter Assad, Berlin” 2015. 26, 32. ↑ AfD MP Hans-Thomas Tillschneider on Facebook. 29. ↑ AfD MP Bjorn Hoecke on Facebook. 47. ↑ Barry Buzan, Ole Wæver, and Jaap de Wilde 1998: Security: A New Framework for Analysis, Boulder. 49. ↑ Presse und Informationsamt der Bundesregierung report. 52. ↑ Salwa Ismail 2018: The Rule of Violence: Subjectivity, Memory and Government in Syria, New York, pp 86-90.